On the left is a Coastal Scents gel liner in 24K, which is a rich gold shade. 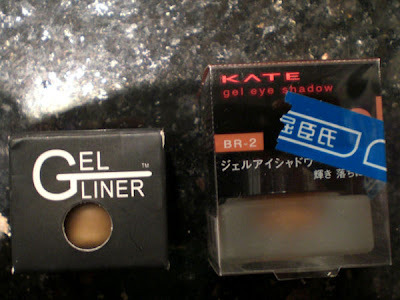 On the right is a Kate gel eye shadow in BR-2, which is gold-brown with sparkles. Both of these come in a small glass pot with a screw-on lid. The Kate shadow is square while the Coastal Scents liner is round. Here are both of them opened. 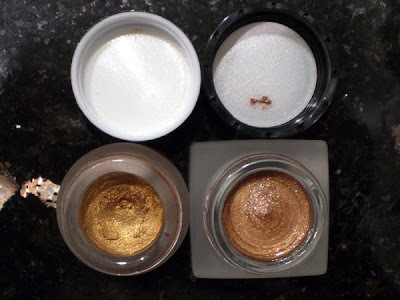 The Coastal Scents is a very rich true-gold color, metallic with no sparkles, while the Kate is more brown than gold and has small silver flecks. Here are both of them swatched on my hand. The Kate shadow (left) has a very unique texture; it is more springy and souffle-like, and when I apply it to my hand it feels cool and watery. You can kind of see the silver flecks in the pic. The color is a bit hard to get even though, and a couple of swipes are needed to achieve the effect in the photo. The Coastal Scents liner (right) is more traditionally gel-like in texture, kind of like a pudding. However, only a single light swap is needed to get a nice even color, and it is very spreadable. 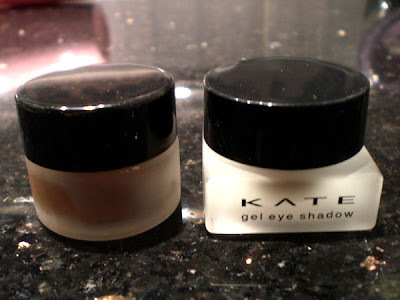 If you like noticeable sparkles in your eyeshadow, I would recommend the Kate gel eye color. It comes in 8 shades including pink, purple and silver, and all of them are very wearable. My sister also got the purple and it is just as sparkly. Of course, if you prefer solid colors, the Coastal Scents gel liner can't be beat; I have already used up more than half of the black one I have (which I used in my Green Shadow tutorial), and I definitely would buy another one.